Christmas decorating has been hectic this year. I had to go through 27 years of decorations and decide what I was going to keep, decorate with this year, save for other years and giveaway. It took a while and poor John must have been up and down the attic stairs a million times. What a great guy I have, very lucky. I have seen everyone’s décor and it has been beautiful. I may not have replied but I was not being rude I was just so busy trying to get things situated. Having Thanksgiving pushed me back as well. Next year, Thanksgiving here is going to be decorated for Christmas. It is just the way it has to be since things take longer. Now the babbling will end and on with our Part One of the Kitchen decked out for Christmas. First picture, giving you a full view of our eating area. The wreaths on the back of the chairs I have had for years. They were purchased from Ballard and are faux Boxwood. I added a pretty wired-edge red ribbon. 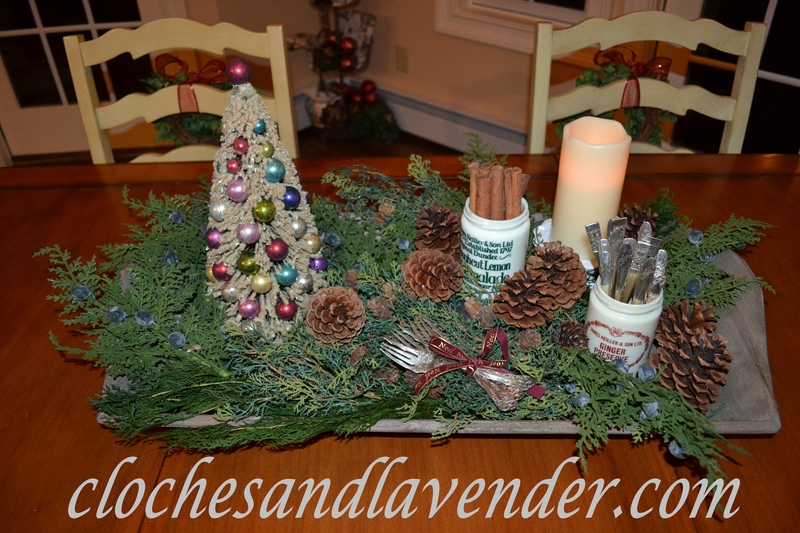 Our centerpiece is a mix of greens, pinecones and a bottlebrush tree. I used a reclaimed wood tray I bought from Décor Steals or Antique Farmhouse, I can’t remember. I received a set of two and the other I used on our dining room table which will be seen in an upcoming post. These advertising jars are transferware I purchased from Nancy’s Daily Dish shortly after we moved in and got somewhat settled. I knew I wanted these and she was having a sale and I grabbed them. I also have the lids. One you will notice is filled with cinnamon sticks and the other is silver plate pieces I received from my dad that were my grandmothers. She had quite an eye for antiquing. 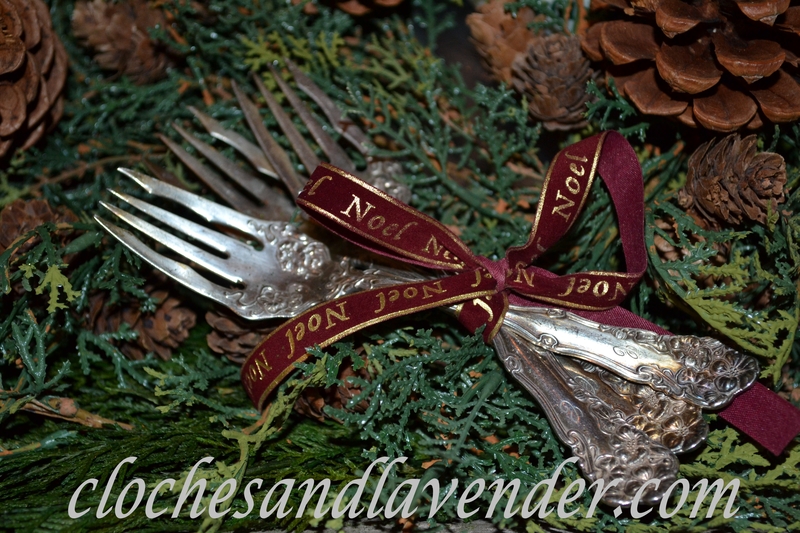 Below is a close up of forks that are part of the collection. These are my favorites. Look at the detail, gorgeous!!! 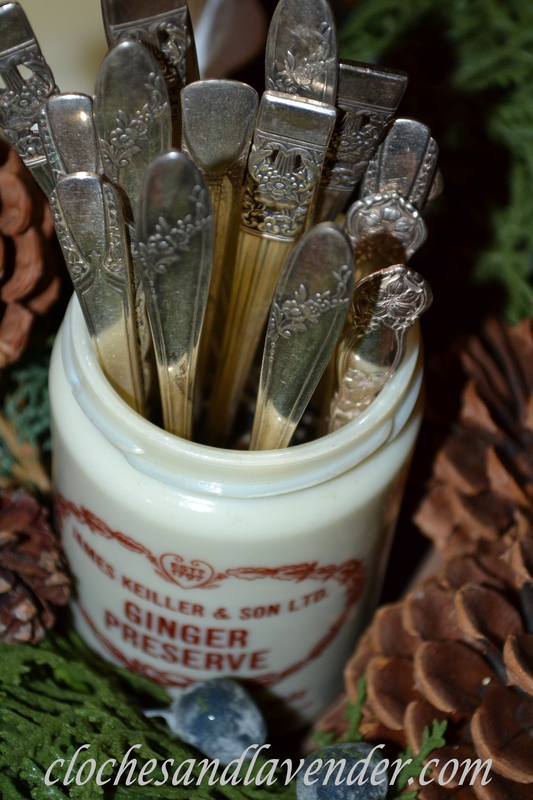 A closer shot of the Ginger Preserve jar and the silver plate pieces, so pretty, jut look at the detail! 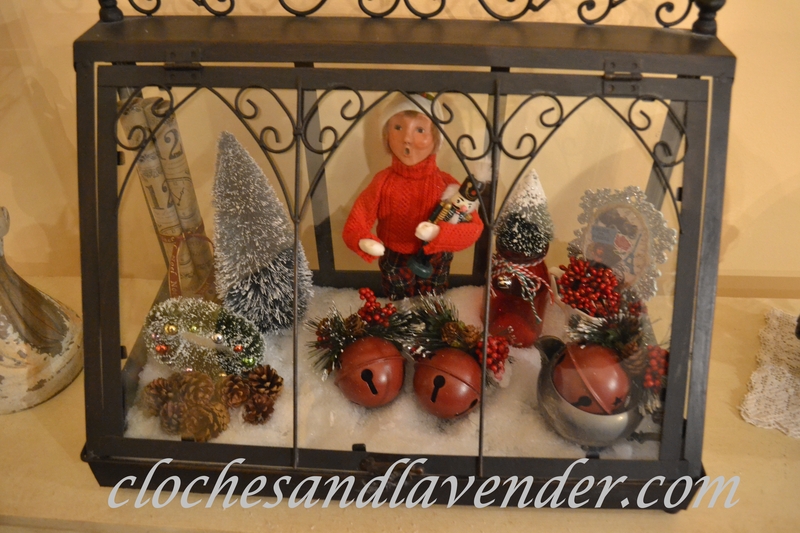 I moved my terrarium to the kitchen for Christmas and placed one of my Byer’s Choice that I have quite collected over time and bottle brush trees, a small bottlebrush wreath and large jingle bells I purchased from Michael’s. The piece of silver is a creamer that was also my grandmothers. I haven’t polished these. I really enjoy the patina. I have the sugar bowl which I used in the bedroom. That post is yet to come. 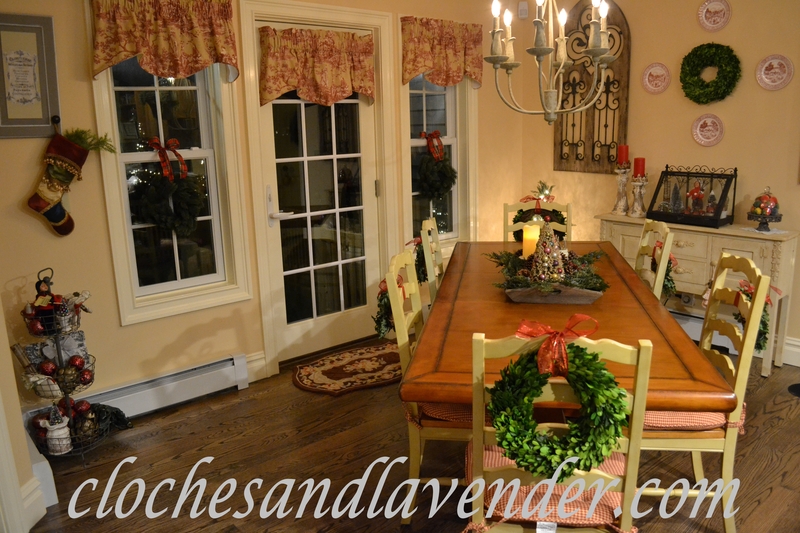 I used larger Boxwood wreaths for the end chairs since these are the captain chairs. You may notice there is no runner or coverings on the kitchen table. This was done for practical reasons. John and I have dinner here every night. The shot below is another angle of the eating area and is showing the small vignette I posted yesterday with my three their basket from Décor Steals. This will be a staple in our kitchen for decorating, love this piece! The small wreaths on the windows by the door are from Balsam Hill. Love their stuff, so realistic looking. I have two larger wreathes I used elsewhere. They will shown in upcoming posts too. I have said upcoming posts quite a bit in this post. Being that I finished later than normal time is running out. I can’t believe Christmas is in two weeks, YIKES!!! I hope everyone has a wonderful weekend. The weather will be a bit warmer in NJ, 40’s to 50. As I mentioned in yesterday’s post, I will be baking and wrapping. I hope you are all doing something you enjoy for the holidays too! Such pretty holiday touches! Hope you’re taking some time to enjoy the season! Hi Cindy, LOVE LOVE LOVE your kitchen. 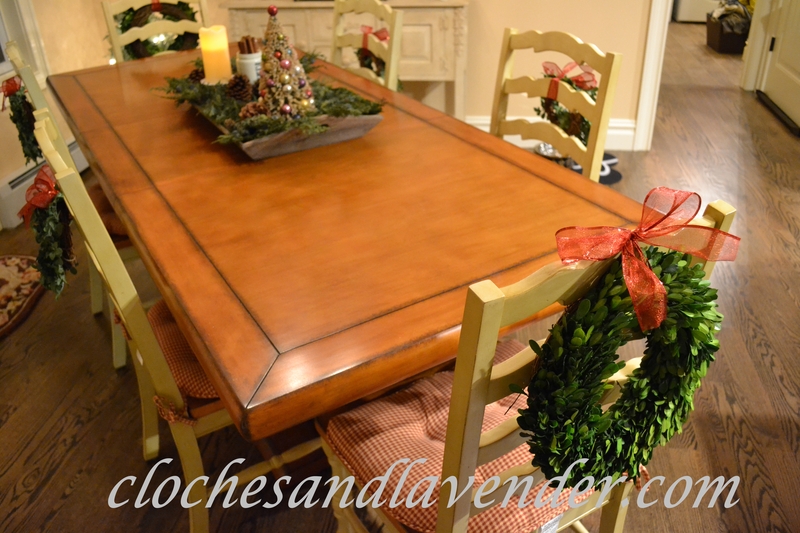 The table with the centerpiece is wonderful and I love the wreaths on the chair backs. Your kitchen is ready and so inviting and filled with the Christmas spirit. It is a warm close to 70 here but gloomy. I’ll be baking and preparing too. Have fun. Everything looks great Cynthia! I know what you mean about getting started early next year. Sometimes we just have to figure things out as we go along. Our temperatures are similar to yours but slightly colder. Seems like winter came early this year with a vengeance! We have the grands this weekend and are.looking forward to doing some Christmas type things with them. Very nice, I like the table very much! Love how you’ve down the table (and on an angle too!!). It’s so fresh looking. You must be having fun going through all those boxes. I remember going through mine when we moved here three years ago. I purged a lot! Love it all Cindy. The only thing missing is Reeses and Peanut in one of the shots lol! Love to see those two. Have a great week end. I was going to add them and actually have them kickoff all my posts. I thought it would be fun and a change. I didn’t know if that is taboo so to speak. So lovely, Cindy! Your centerpiece is beautiful and I always like the look of wreaths on the back of chairs. Cynthia, everything looks just beautiful! Love the boxwood wreaths on the chairs. 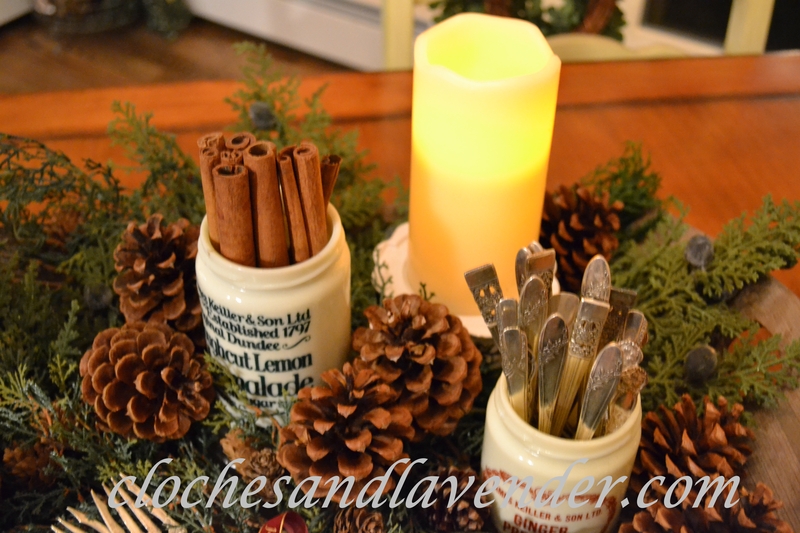 The reclaimed wood tray, transferware jars, and silverware is just gorgeous! Christmas has come so fast this year! I LOVE your centerpiece! The jars are really nice and I love the collection of silver plate. I also love the vignette in the terrarium. Everything looks really cozy! Have fun baking! It’s so beautiful Cindy! I love your kitchen! I see in your jar of silver plate a pattern that belonged to my mother and which I made the mistake of not keeping. 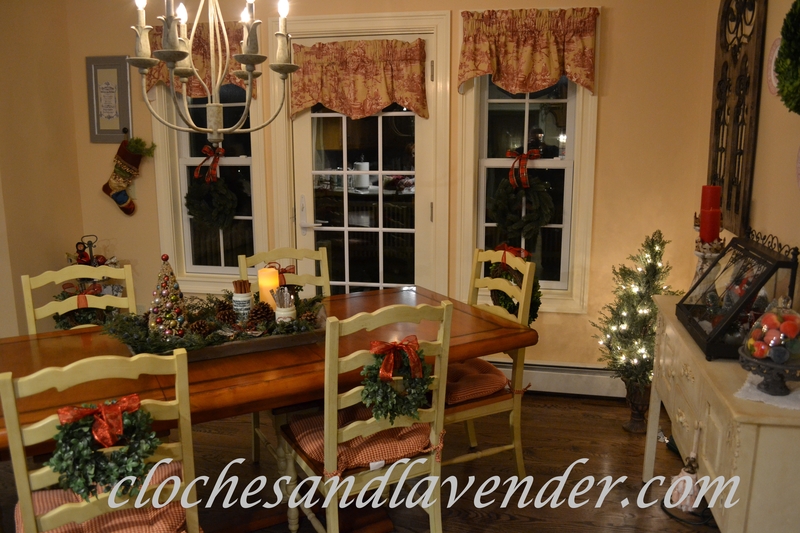 What a pretty Christmas kitchen, Cynthia! Would love to enjoy a cup of coffee there with you. Merry Christmas to you and your family! Your kitchen looks so festive, Cindy! I love all the wreaths. I like to keep my table centerpiece simple, too, since we eat at it most nights (otherwise it’s the kitchen counter). I like your window valances.